HomeAll PostsNewsWorldofangelique.com Asks: Anne or Sergeanne? Although the majority of the 150 million-plus books that have been sold bear the name Sergeanne as the creator of Angélique, the name stands as the world’s most bizarre literary compromise. 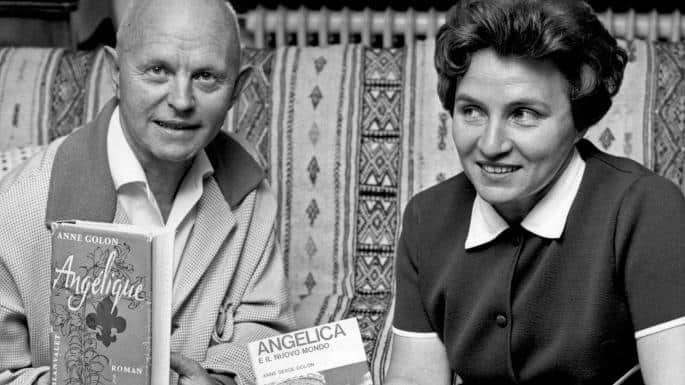 After the first Angélique book was published in Germany in 1956, Anne Golon’s agency in Paris decided that, for the French edition, having a woman’s name on the cover was not good for marketing. The kind of readers that they would be targeting would be much more comfortable, their agency told them, if they thought that the books had been written by a man, as it would “make it appear more serious”! The agency wanted to credit the book to Serge Golon, who, after all, had collaborated with his wife, helping with the vital and meticulous research which gives the books their historical accuracy, and helping to manage the difficult logistical project of bringing the plot and the story to life. Anne didn’t care, as all that mattered to her was her husband and children, and the fact that her books were helping them to escape from poverty. But Serge refused, saying it was his wife’s work. Although he had contributed to the research, he had nothing to prove, and who had no interest in seeing his name on a book he hadn’t written. Serge was proud of his wife’s talent as the writer with the imagination to create the characters, the intrigues and lay out the plot and structure. He saw it as her gift and her job to write, while his passion was for science, mines and geology, in which he had many projects of his own. A compromise was reached with the agency and in France the book appeared under the title of Anne et Serge Golon in 1957. Then, without consulting Anne or Serge, the agency decided to publish the book in English under the name Sergeanne Golon. They were not informed until the book was already a bestseller in English, and the agency’s excuse was that it was “better for English marketing”. That, and the total absence of any author information on the English language editions, is the reason why millions of English speaking Angélique readers still don’t know the true identity of the author. In fact, Golon is, itself, only a pseudonym. Serge Golon’s real name is Vsevolod Sergeivitch Goloubinoff, which he had shortened to Golon because it read better. Anne was born Simone Changeux and adopted various pen names over the years before settling on her now world-famous identity. Just to make things even more complicated, family and close friends call her Joelle (as did Serge) from a previous pen name. For convenience, this website only ever refers to her as Anne Golon.